Here’s the latest on my Orkney Pi Shawl. You might recall that I was nearly finished with the knitted-on edging when tragedy struck. I ran out of yarn. I immediately ordered more yarn, and a book to boot, from Sharon Miller’s Heirloom Knitting in England. Both items were shipped on Tuesday, June 16. The book arrived last Monday, June 22. Who knows where the yarn is? I’m hoping it will arrive today. In the meantime, I needed something to work on besides socks, so I decided to start swatching for St. Enda. My swatches are blocked out on the new foam blocking squares sold by Knit Picks. I haven’t tried them out fitted together, but they work quite nicely on an individual basis. Knitting swatches for St. Enda has given me time to think about how I want to construct the sweater. Alice Starmore designed the sweater to be knit in pieces and seamed together. 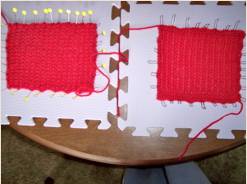 Since I don’t like seaming, I plan to work it in one piece. The big decision is whether to knit it top down or bottom up. Right now I’m leaning toward bottom up, and attaching the shoulder straps to the shoulder stitches as I knit them, the shoulder straps. Then I can pick up the sleeve stitches around the armholes and knit the sleeves from the shoulders down. The big cable appears to me to look the same whether knitted from the bottom up or the top down, so I shouldn’t have to make any adjustments; I should be able to simply knit the cable as charted. I usually think about knitting a lot. But the past few days I’ve had even more time to think about knitting. I went grocery shopping last Thursday. On the way back to my car, I managed to bang my toe on the wheel of the cart. Ow! I hate it when I do that! LOL Anyway, I stoved the toe just to the right of my pinky toe pretty good. Not only did the toe turn purple, but the top of my foot now has a huge bruise on it.